Super Street Fighter 4 With Vewlix VS is the latest Street fighter series from Capcom. Super Street Fighter 4 With Vewlix VS features new characters, new stages, new bonus stage, and new ultra combos. The latest Street Fighter Edition includes the full roster of 25 characters and adding ten new characters from Street Fighter IV including Adon, Cody, Dee Jay, Dudley, Guy, Hakan, Ibuki, Juri, Mokoto,T.Hawk. Furthermore, this edition incorporates improved online experience, team battles, replay channel, tournament mode, and new challenge mode. Super Street Fighter 4 comes in a Vewlix VS cabinet. This cabinet comes with a 32 inch widescreen LCD screen which supports resolutions from 640x480 (VGA) to 1360x768. Input connection is via 15pin D-sub or DVI. Also, the screen can be rotated if so desired. Super Street Fighter 4 With Vewlix VS is the latest Street fighter series from Capcom. Super Street Fighter 4 With Vewlix VS features new characters, new stages, new bonus stage, and new ultra combos. The latest Street Fighter Edition includes the full roster of 25 characters and adding ten new characters from Street Fighter IV including Adon, Cody, Dee Jay, Dudley, Guy, Hakan, Ibuki, Juri, Mokoto,T.Hawk. Furthermore, this edition incorporates improved online experience, team battles, replay channel, tournament mode, and new challenge mode. 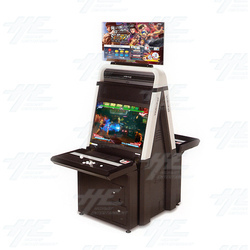 Super Street Fighter 4 comes in a Vewlix VS cabinet. This cabinet comes with a 32 inch widescreen LCD screen which supports resolutions from 640x480 (VGA) to 1360x768. Input connection is via 15pin D-sub or DVI. Also, the screen can be rotated if so desired.